Inspired by all the recent talk regarding the Gelli Plate, I thought I get mine out for a play... I slowly built up the layers, starting with iridescent white and cadmium Red I pushed my butterfly stamp into the wet acrylic and pulled off the first print. 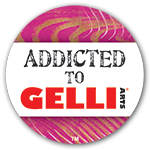 I charged my Gelli with copper acrylic and used it as an ink pad. I also used gold and bronze acrylic to really give the picture depth. I found the Stamp very easy to clean in lightly soaped water. I must say, I enjoyed that (and made several other backgrounds whilst I was there! A really lovely effect Amanda! I'm still thinking up what I'm doing for the challenge...well done for being the first one to get yours done! Lovely artwork again Mandy, enjoy spending you voucher! I'm especially excited now Karen, having just watched Barbara, to get my mits on those stencils! I just can't wait! Thank you all for the wonderful comments! 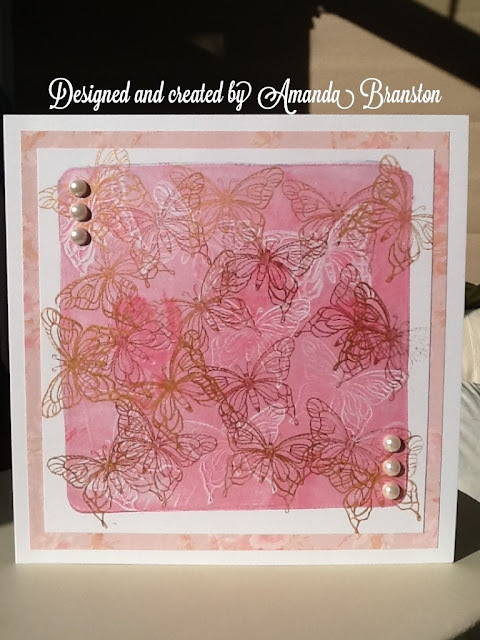 A lovely feminine card Amanda, and love the color. Thanks for entering quick off the draw, and good luck. This is such a great card, such a pretty colour too.